Discussion in 'UK Wine Forum' started by Otto Nieminen, Jan 22, 2018. Orange wines are still pretty rare here so I'm always interested in trying any that become available. Today I noticed two from a big Georgian producer, Tbilvino, made in qvevris - those large amphorae-like clay containers which are buried in the ground for ageing. Gold colour and smells like a sweet wine of such colour! Aromatic, floral and honeyed I was kind of expecting something like Mosel Auslese but instead it is dry and slightly tannic. It is moderate in body, refreshing despite not having high acidity, clean and fun. Quite an easy style of orange wine. Very nice. Buy again? Oh yes. Also a gold colour but this has no aromas that would make me think sweet wine. It smells of fresh guavas. It is strongly tannic (but not so aggressively that it would take the fun out of the wine) and has the bite of an alligator. Yeah. I like it. Tbilvino might be a huge winery but they sure can make wine with personality. Buy again? Certainly. I am starting to find some orange wines showing up in my area, many costing up to $40 Cdn and more. Today I purchased 2016 Vazisubani Estate Rkatsiteliso interested in seeing what all the "orange wine" fuss is all about. Nice notes,Bob. Good reminder to have a try at this style again. 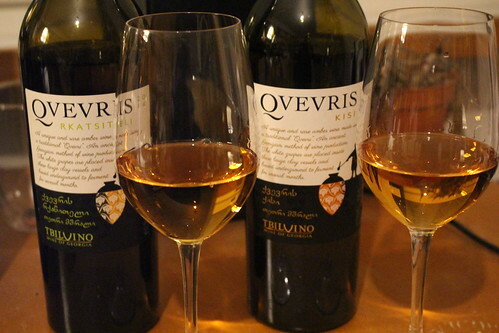 For people in the UK wanting to try the Rkatsiteli, it must be very similar, if not identical, to the qvevri wine sold by M&S. I certainly had the M&S one down as an easy-going orange wine. Not great, but worth the £10.50 or so that it costs. The Kisi sounds more fun!